Rounding up some recent minor league transactions from around the baseball world…. The Marlins have signed outfielder Gabriel Guerrero to a minor league deal, as Guerrero announced on his personal Instagram page. The 24-year-old has bounced around the farm systems of the Mariners, Diamondbacks, and Reds during his eight-year pro career, finally cracking the big leagues in 2018 by appearing in 14 games for Cincinnati. He was outrighted off the Reds’ 40-man roster in October, paving the way for another trip to free agency. Guerrero has a .273/.314/.413 slash line and 80 home runs over 3612 PA in the minors, showing glimpses of potential but never really establishing himself as a top-tier prospect. The White Sox re-signed first baseman Matt Skole to a minors deal, as per Baseball America’s Matt Eddy. Originally a fifth-round pick for the Nationals in the 2011 draft and a noteworthy prospect in Washington’s farm system, injuries hampered Skole’s progress, and he didn’t make his MLB debut until last season. After joining Chicago’s organization as a minor league free agent last winter, Skole appeared in four games for the Sox and accumulated 13 plate appearances, before being outrighted following the season. The 29-year-old Skole has a career .250/.356/.441 slash line and 116 homers over 3284 career PA in the minors. Also from Eddy, the Mariners signed infielder Orlando Calixte to a minors pact. Calixte spent all of 2018 at the Giants’ Triple-A affiliate before electing to become a free agent after the season. Calixte has been a shortstop for much of his nine-year professional career, though he has also seen significant time as a second and third baseman, and in all three outfield spots. This versatility helped him reach the majors in 2015 (two games with the Royals) and 2017 (29 games with the Giants) despite only hitting a modest .249/.303/.385 over 3628 PA in the minors. The Reds announced today that they have selected the contracts of catcher Tim Federowicz and outfielder Gabby Guerrero. To create 40-man space, the organization recalled righty Keury Mella and placed him on the 60-day DL. That pair of newcomers to the MLB roster will be joined by righty Tyler Mahle. The well-regarded young hurler has already spent most of the season in the majors, of course. Federowicz joined the Reds earlier this year on a minors pact after he was cut loose from the Astros. The 31-year-old will now have seen time with five MLB clubs over parts of seven seasons. Though he hasn’t hit all that well thus far at the Triple-A level in the Cincinnati organization, and is a marginal hitter in his limited experience at the game’s highest level, Federowicz will provide some welcome catching depth down the stretch. He’ll be eligible for arbitration at season’s end, though it stands to reason that he’ll be allowed to test the open market. As for Guerrero, he originally came to the Cincinnati organization on a waiver claim, then was non-tendered and re-signed in the winter of 2016. Today’s news means that he’ll beat his cousin, elite Blue Jays prospect Vladimir Guerrero Jr., to the big leagues. Of course, Gabby is now 24 years of age, so he had more than a five-year head start. He earned his way up after a solid year in the upper minors, during which he slashed .293/.328/.474 with 19 home runs in 539 plate appearances. The Braves have announced a one-year major league agreement with left-handed reliever Jacob Lindgren, whom the Yankees non-tendered Friday. The 2014 second-round pick briefly cracked the majors in 2015, but elbow issues limited him both that year and this past season. Lindgren threw just seven innings in 2016 – all with the Yankees’ High-A affiliate – before undergoing Tommy John surgery in August. The 23-year-old could miss all of next season while recovering from the procedure, but the Braves will retain his rights beyond then if he’s on their 40-man roster, as ESPN’s Keith Law notes (via Twitter). Two days after the Reds non-tendered Gabby Guerrero, the club has re-signed the outfielder to a minor league deal, according to Zach Buchanan of the Cincinnati Enquirer (Twitter link). The Reds claimed the nephew of former major league star Vladimir Guerrero off waivers from the Diamondbacks last week. The soon-to-be 23-year-old was a well-regarded prospect with the Mariners at one time, but he struggled with the Seattle and Arizona organizations over the past two seasons. Guerrero posted a .223/.258/.346 line in 488 Double-A plate appearances in 2015, when he was part of a trade involving Mark Trumbo and Welington Castillo, and stumbled to a combined .234/.281/.383 showing with the D-backs’ Double-A and Triple-A affiliates last season. The Reds have claimed catcher Juan Graterol off waivers from the Angels and claimed outfielder Gabriel Guerrero off waivers from the Diamondbacks, the team announced today. In order to clear room on the 40-man roster, the Reds have designated right-hander Keyvius Sampson and catcher Ramon Cabrera for assignment. The 22-year-old Guerrero is the nephew of former Major League superstar Vladimir Guerrero and long rated as one of the top prospects in the Mariners’ system before being traded to Arizona in last year’s Mark Trumbo/Welington Castillo trade. Guerrero posted strong numbers as recently as 2014 in Class-A Advanced — .307/.347/.467 with 18 homers and 18 steals in 530 plate appearances — but his production has plummeted upon reaching the upper levels of the minors. He hit just .223/.258/.346 between his two organizations’ Double-A affiliates in 2015 and struggled similarly this year, hitting .234/.281/.383 between Double-A and Triple-A. Graterol, 27, made his Major League debut and tallied 15 PAs with the Halos this past season. The former Royals farmhand spent the 2015 season in the Yankees organization before inking a minors pact with the Halos last offseason. He’s a career .274/.306/.338 hitter in parts of three seasons (95 games) at the Triple-A level and has halted stolen base attempts at a very strong 38 percent clip in the minors. Baseball Prospectus gives him average pitch-framing grades in the minors as well. Sampson, 25, pitched 39 1/3 innings with the Reds this year across 18 games — two starts, 16 relief appearances — and logged a 4.35 ERA with 9.6 K/9 against 6.2 BB/9. Control has long been an issue for Sampson, who has walked 53 men, hit two batters and also rattled off seven wild pitches in his 91 2/3 big league innings. The former Padres farmhand pitched well in the minors up through Double-A but began to struggle at Triple-A (5.18 ERA in 231 innings) and clearly hasn’t fared much better in the Majors, where he owns a collective 5.60 ERA. Cabrera, meanwhile, made his big league debut with the Reds in 2015 and played in a career-high 61 games for Cincinnati this season. The 27-year-old received 185 plate appearances due largely to the season-ending injury sustained by Devin Mesoraco and batted .246/.279/.357 with three homers and 10 doubles. He’s a lifetime .274/.327/.343 hitter at the Triple-A level and could end up elsewhere on waivers, though he’s never excelled at throwing out runners (23 percent in the minors) and draws routinely negative framing marks. From that standpoint, it’s not difficult to see why the Reds felt that Graterol was a superior option to function as the third catcher on their 40-man roster, behind Mesoraco and Tucker Barnhart. The D-backs announced that they’ve designated outfield prospect Gabby Guerrero for assignment in order to clear a spot on the 40-man roster for infield prospect Domingo Leyba. Guerrero, the nephew of former MLB superstar Vladimir Guerrero, was acquired from the Mariners in the 2015 trade that sent Mark Trumbo from Arizona to Seattle. Though he long rated as one of the top prospects in the Mariners organization, Guerrero’s performance stalled in 2015-16. He hit just .223/.258/.346 between his two organizations’ Double-A affiliates in 2015 and struggled similarly this year, hitting .234/.281/.383 between Double-A and Triple-A. Leyba, meanwhile, went from the Tigers to the D-backs in the three-team trade that sent Didi Gregorius to the Yankees, Shane Greene to Detroit and Leyba and Robbie Ray to Arizona. The middle infielder hit .296/.355/.429 between Class-A Advanced and Double-A as a 20-year-old this past season. He played primarily shortstop this season, though there’s been some question in past scouting reports about his ability to stay there, with some opining that Leyba is best suited for second base. Diamondbacks GM Dave Stewart joined Mike Ferrin of MLB Network Radio (audio link) to discuss last night’s multi-player deal sending Mark Trumbo to the Mariners. 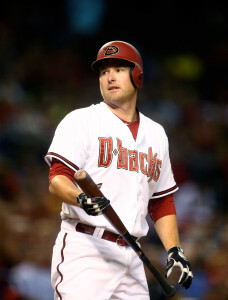 He explained that Welington Castillo (acquired in the deal) was not initially a backstop that had interested him upon taking the helm in Arizona — as he hinted, the club conceivably could have made that move when shipping Miguel Montero to the Cubs — but that the loss of Tuffy Gosewisch forced the team’s hand. “The first guy on my list of catchers was [Dioner] Navarro up in Toronto,” said Stewart, who explained that he “had [him] in my sights even in the winter months, before the Winter Meetings.” Stewart added that prospect Gabby Guerrero, who also comes over in the trade, impressed the club this spring. New Dodgers infielder Hector Olivera will make his professional debut tomorrow at Double-A, Bill Plunkett of the Orange County Register tweets. Director of player development Gabe Kapler had positive things to say about Olivera’s early time in the organization, as Plunkett also reports. “He clearly can handle either” second or third, Kapler added. Dodgers closer Kenley Jansen was unavailable last night for unknown and somewhat mysterious reasons, as Mark Saxon of ESPNLosAngeles.com reports. Something apparently occurred during the game itself that changed his status, but what that is has yet to be reported. Meanwhile, four other relievers oversaw a 9th-inning meltdown in Colorado. After the game, the team said that Jansen “wasn’t feeling well, while ESPN’s Rick Sutcliffe tweeted that he was “sending [his] prayers” to the Dodgers and their closer, adding to the intrigue. The outstanding power pitcher has dealt with heart issues in the past, including experiencing an irregular heartbeat while in Denver. Diamondbacks outfielder David Peralta has changed agencies and is now a client of ACES, Devan Fink tweeted recently and ESPN.com’s Jerry Crasnick confirms (Twitter link). The 27-year-old has quickly established himself as a solid major leaguer, and owns a .280/.323/.460 slash line in his first 490 plate appearances. With just 120 days of service accumulated last year, he’ll likely not qualify for arbitration until 2018.